Clapotis the First was knitted under-sized, in HipKnits Aran silk.Â Clapotis the second was smaller still, and knitted again in pure silk – this time from Colourmart. A third undocumented Clapotis was a reprise of the second, but in Royal Blue. I think there may have been another, knocked off quickly for a gift and never recorded.Â This is my first non-silk Clapotis, and the first knitted to full size. It may well not be my last. I don’t just enjoy knitting them — I also love wearing them! Notes: Knitted to full size –Â in my usual manner of purling the stitches to be dropped, no stitch markers used. I purchased five skeins of yarn to be sure of having sufficient: Clapotis calls for four skeins ofÂ 205yd/184m and Art is a little shorter. A bit of a knitting saga ensued. None of the skeins matched. I handled this byÂ starting a new skein before finishing the old one and knitting a couple of rows from the terminating and starting skeins alternately. Once I was happy with the joining, I cut off the end of the old yarn. In this manner I got close to the end of my knitting on just four skeins. Rather than start the fifth skein, I joined in the three remaining ends, one by one, with a spit join. Yes, it was as ugly a result as you might have expected. I frogged the end back and joined in the fifth skein as I should have done in the first place and am now much happier with the finished result. 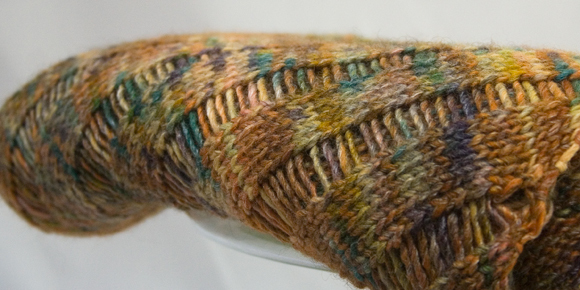 Now, it is an interesting thing about this Art yarn — when I made the Ripley hats, it felt very silky and when I dropped stitches, they had a tendency to run quickly. This was the reason I felt that it would be a good choice for the Clapotis. However… Art is a fairly hairy yarn and the stitchesÂ are easily caught up in the next stitch… just by a few fibres, not really what you’d call a split stitch, but enough to stop the stitches from running easliy when it comes to dropping time. I spent a long time, sitting with a spare needle in hand, teasing stitches apart and encouraging the ladders to happen. Once that was done and the Clapotis was washed and blocked, it gained all the necessary drape. 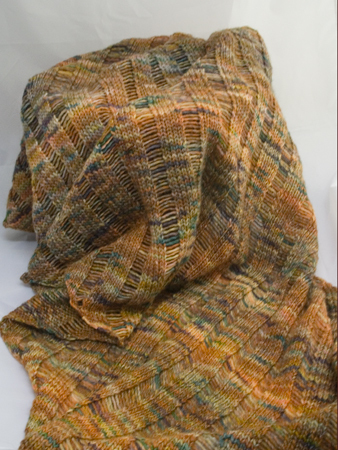 I used 429 grams and the finished dimensions are approx 24″ wide and 72″ long.Â Plenty large enough to call a wrap, but flexible enough to wear as a scarf. I took the thing to Spinning Group this week and found it interesting the ways in which the different ladies chose to wear it. It was much admired… to the extent that a couple of the ladies asked me if I would sell it. My reply was “No” but on reflection, I would say “Yes”. Buy me 5 more skeins of Art in any of the 120 available shades,Â and I am more than happy to knit myself a replacement. Not Madras, though. I like it but I don’t want to sit and look at acres of the same colour again. Dusk is nice, and that is on sale at the moment. Florentina is wonderfully vibrant, and Jay and Kingfisher are both wonderfully lush. Or maybe Monet or Gaugin? I love Colinette colours. With most of a skein left, I think there will be a matching Madras hat soon. Possibly another Ripley. I’m still on the Finish 2, Start 1 regime, though. I never get tired of a good knitting pattern. You did a wonderful job on your Clapotis! 🙂 It’s a classic. It should be just fine once the stitches are dropped and you’ve washed and blocked it. What is the yarn composition?